There can be such a century spirit in a simple legend than in the truest pages of History. There may be as much of the century spirit in a mere legend than in the truest pages of History. Victor Hugo, with the sentence "the legend of the centuries" was not wrong. Nothing is innocent. Mortum-mare, Sea-Life, the etymology of Mortemer weighs on these places ... The forest, the wild and unknown place, where elves and goblins rule, has she taken over reason? For over 80 years, Mortemer is a haunted place. 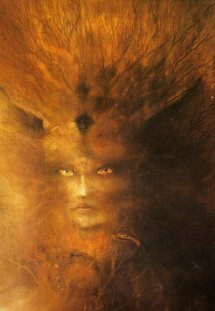 Mere legend, the Garrache, this wolf woman, appeared in 1884 to Roger Saborreau? 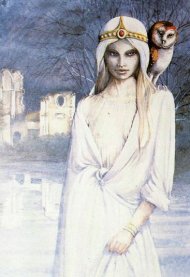 Mathilde, the white lady, woman and dream once, or the ghosts of four monks massacred during the Revolution? People refuse to believe it but the rumor is constantly making reference to it. The Abbey was exorcised in 1921. Jacqueline Charpentier Caffin, current guardian of the places displayed reason kept. A guide to Northern accent claimed to have been accompanying a girl to visit the Abbey. She threw a hairpin in Sainte Catherine source. The following year, she returned with her husband met through this gesture. Another witness, left alone in the Abbey one afternoon to complete a job, heard for a few seconds a person steps on the ground floor. Circling parts, he hasn’t seen anybody. He confessed: "It was the heavy steps of someone walking slowly and thinking. I really was very scared, and even today I do not know what to think." Disturbing, isn’t it ? Belonging to the Cistercian order, the monks had to banish all comfort. However, the chapel behind the pantry was heated up. How? No one can say. In winter, the snow at this location does not remain. Vegetation grows very early and a true well-being emanates from there inexplicably. Nobody could ever achieve excavate the site of Mortemer. Capital, death, always frustrated these projects. The Abbey formerly contained many prohibitions. Thus, weddings and banquets were always close at two o'clock in the morning. Venture there on a full moon night after August 15? Nobody thought. Today, it happens that the phone lines are mixed, the current sudden drops inexplicable tension despite the work done and the arrival of specialists. Moreover, the Abbey is not the only place in the region to have been the result of inexplicable events. Eure, with its mists of morning, its rains, lives with a rich mysteries past. Materialism and rationalism of the century failed to end this "Wonderful". Inside the Mortemer Abbey, there is a XIIth century washbasin where the monks used to wash their face, their hands, and their feet before going to dine. 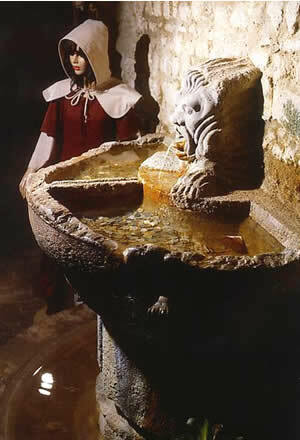 There is still magical virtues water springs: this is the Fountain Sainte Catherine. Close or far regions, marriageable girls came and still come to the fountain, they will throw a hairpin, or a coin to find a husband within the year. This legend gave birth to three prayers. notre place dans le monde. Legend ? You said Legend ?